In an active/standby group, the primary server is processing, and the back-up servers are standing by in case of a failure on the primary server. The standby systems can be smaller, lower-performance systems, but they must have the processing capability to assure resource availability should the primary server fail. AppA on Server 1 fails over to Server 2. AppB on Server 3 fails over to Server 2. AppC on Server 4 fails over to Server 2. Disk ownership. Different active applications cannot use disk slices on the same volume. SIOS Protection Suite applies locks at the volume level. When the SCSI locks are applied, only one system on the shared SCSI bus can access volumes on the disk device. 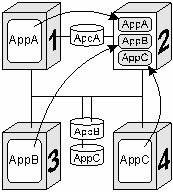 In the example, Server 3 has ownership of the AppB disk resources and Server 4 owns the AppC resources. Processing capacity. Although it is unlikely that Servers 1, 3, and 4 would fail at the same time, you must take care when designating a standby server to support multiple resource relationships so that the standby server can handle all critical processing should multiple faults occur. SIOS Protection Suite administration. In the example, Server 2 provides backup for three other servers. In general, it is not desirable to administer the SIOS Protection Suite database on the different logical groups simultaneously. You should first create the resources between the spare and one active system, then between the spare and another active system and so on.